I'm so excited about today's tutorial! I know I might keep saying that, but this is literally the way I do my hair just about every day. Its how my hair is while I sleep most of the time (just higher on my head), its what I look most day's when I'm not going anywhere, and its even how I look on a lot of date nights, etc when I'm in a hurry. I just comb up the sides and give it a little 'oomph' and I'm all good to go! Step #1: Start with day+ old hair or spray on some dry shampoo or a bit of hairspray for some good texture. Fluff up your hair a bunch for some body, brush it back with your fingers into a ponytail. Step #2: Tug the sides out a bit if you need more body. 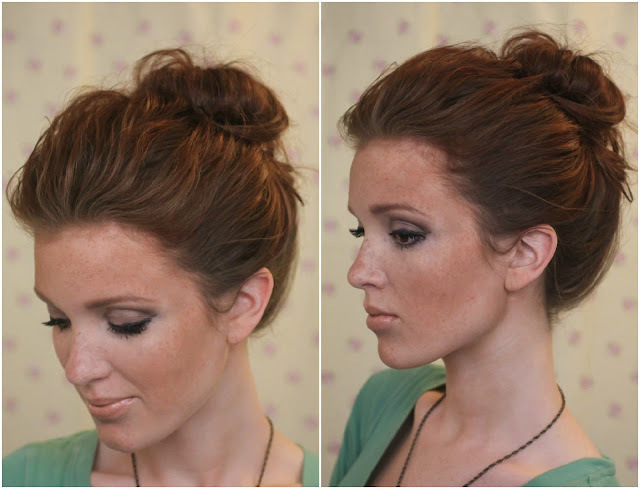 Twist the hair about half way down and then twist on your head about half way into a ballerina bun. Step #3: Holding the half-bun with one hand, grab the loose hair and spread it over the bun, holding in place with your palm. Pull a hairtie over the top of everything and tug it tightly before twisting and bringing over the top of the bun a second time, releasing halfway. 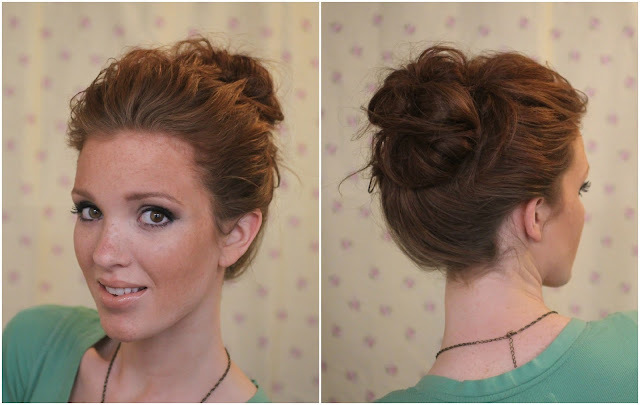 Step #4: Tug the hair out of the bun a bit if you want a bigger bun, and pin a few wild pieces in place if necessary. Comb your fingers along your scalp to make sure everything is in place, and get the whole thing with a good mist of hairspray. Best bun ever! Oftentimes I do the same thing only if I don't have a hairtie around I stick a pen in one side and out the other, but that's another story! Anyways, for those who've asked, this is my most used hairstyle hands down, and I hope you give it a try and love it too! Thanks for droppin by to say hi, and if you have any questions, feel free to ask me anything! Such a pretty look!!! Love it!! It looks easy to do and it's so cute! I'm so glad! I think the tutorial makes it sound harder than it actually is, so that's good to know! What did we do with our hair before the top knot came along?? ....I guess the same thing, we just called it a messy bun!! haha! This looks beautiful! Such a classic, pretty hair look! I need to try this!! You make it look so effortless and perfect. Very lovely! I wish my hair could look this amazing in 10 seconds! And I use to do a lot that top-knot, when my hair was "big". Ah I wish my day old hair looked as voluminous and non-slick as yours! Thanks for stoppin by, and for your comment! Thank you for the tuto! I tried this today, and expected to it to be harder than you made it sound because buns always end up super tight and uncomfortable for me, BUT it was soooo easy! I loved how it turned out. I need to figure out how to make it more relaxed like you have it, but overall this was an amazing tutorial and bun! Thanks for sharing! When you sleep on it like this, how does your hair turn out in the morning? What do you mean by "releasing halfway"? I third a video! Did this yesterday and today... definitely the best easy topknot I've tried and it looks so cute! What brands of dry shampoo do you recommend? So cute!! I need a new quick hair style -- trying this one ASAP! This is SO cute and I'm trying my hardest and I can't get it right... the first time you say to pull it back in a pony do you mean to secure that pony with an elastic or you're just holding it in your hand? Do you only secure it at the very end? Then when you say to release half way, you mean not have the elastic go all the way around your bun with the first? Ugh... am I the only confused??? I'd love a video! I really need some quick stuff like this or the hair has got to get chopped for all this July heat! Thanks so much in advance if anyone can help dumb me! I just joined today, and you are the first I seen! I love your hair, I am always looking for something new to do to my hair. Thank you for sharing! I look forward to following you. AMAZING! If only mine looked half as good as yours though, haha! What lipstick/gloss are you wearing?! You're gorge! what lipstick/gloss are you wearing? You're gorge! Yep..I love my top knot so much, I named my craft business after it!! Between topknottin it up EVERYDAY and my love for peacocks, I thought.......Why Not!!! Beautiful hair BTW, and Great tutorial! It is really mind blowing hairstyle. Easy and can make it up in few minutes.....................................!!!!!!!!!!!!!!!!!!!!! My buns always turn out weird so thank you SO MUCH for this! I did this style for work this morning and I absolutely LOVE IT. I followed your youtube tutorial and it was so easy! I made sure my hair was a little dirty and I have volume I don't normally have. I can't wait for more videos. Thank you! Its a nice tutorial ! good to see this post !